Not sure how this depicts The Papess or High Priestess? Click here. Etteilla: The Female Querent, Nature, Retreat, A Withdrawn Life, Silence, Reproduction, Garden of Eden. Lévi: This Hieroglyph, the Female Pope, is a woman crowned with a tiara, wearing the horns of the Moon and Isis. I strongly commiserate the unlucky scholar who has seen in this antique symbol nothing but a monumental portrait of his pretended Pope Joan. Illustration (right): The Papess from Ancien Tarot de Marseille by Paul Marteau (1930) (copyright &COPY; 1980 Grimaud). Click the image for a larger one. Christian: This symbolic figure personfies occult science waiting for the initiate on the threshold of the sanctuary of Isis to communicate to him natures secrets. Papus: This is the picture of Isis, of Nature, whose veil must not be raised before the profane. Upon her knees lies an open book, which she half covers with her mantle. This indicates that the doctrines of Isis are hidden; but she divulges to the magi the secrets of the true Kabalah and of occult science. Felkin: The High Priestess is the great feminine force controlling the very source of life, gathering into herself all the energising forces and holding them in solution until the time of release. Waite: The High Preistess is really the Secret Church, the House which is of God and Man. In a manner, she is also the Supernal Mother herselfthat is to say, she is the bright reflection. It is in this sense of reflection that her truest and highest name in symbolism is Shekinahthe co-habiting glory. Illustration (left): The High Priestess from The Rider Tarot Deck designed by A. E. Waite, drawn by Pamela Colman Smith (1909) (copyright &COPY; 1971 U.S. Games Systems). Click the image for a larger one. Wirth: She is the priestess of mystery, Isis, the goddess of deep night and without her help the human spirit could not penetrate the darkness. The divination which the Priestess inspires, applies to the discernment of reality which hides behind the veil of what is apparent to our senses. Case: The High Priestess corresponds to all the virgin goddesses of the ancient worldto Artemis, Mai, Bona Dea, and Kybele. She also represents Eve, before her union with Adam. 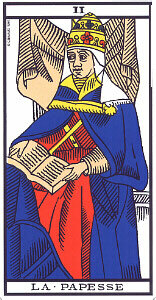 Crowley: The card represents the most spiritual form of Isis the Eternal Virgin; the Artemis of the Greeks. She is clothed only in the luminous veil of light. It is important for high initiation to regard Light not as the perfect manifestation of the Eternal Spirit, but rather as the veil which hides that Spirit. Gray: Unrevealed future, silence, mystery, duality. Hidden influences at work. Sadhu: This arcanum is feminine in character. 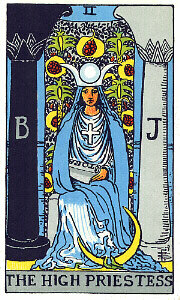 The moon seen in it suggests to us the idea of maternity (the moon being the Universal Mother in occult tradition). So, astrologically, the Priestess belongs to the moon. 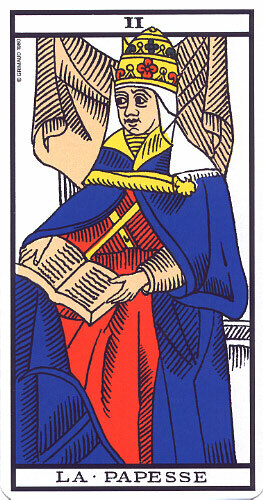 ONeill: The Papess suggests the heretical influences on the Tarot. As a female pope she represents the unorthodox. The Papess represents not orthodox religion, but the secret, the occult, and the heretical. She represents the mysterious, intuitive aspects of Gnosis, the secret esoteric knowledge unveiled in the Mysteries. Pollack: The High Priestess represents all these qualities: darkness, mystery, psychic forces, the power of the moon to stir the unconscious, passivity, and the wisdom gained from it. Turk: The Arch Priestess presents us with two possible aspects of herself, the first being the goddess Hecate, she of the triple faces of birth, life, and death. The second aspect is the goddess Selene, who is the moon, month, mene, and the sister of Helios, the sun. In this aspect she illumines the night, the period during which the essense of the individual disappears after the time of death and before the new birth. Symbol (above): It depicts (left to right) the dark pillar B (short for Boaz), a crown comprised of a horned orb, and the light pillar J (short for Jachin). These elements often comprise, in part, this Arcanum.